Silas Redd played just six games this season battling a knee injury. One rule often spoken in recruiting is: don’t choose a school because of a coach. Silas Redd is aware of that rule but disregarded it. His sights were set on Penn State and playing for head coach Joe Paterno. There was no getting around that. A Penn State fan since youth, the 2009 US Army All American’s dreams came true when he signed with the Nittany Lions coming out of high school. That dream quickly turned into a nightmare. Now a senior and preparing to, potentially, play in his final collegiate game (Redd has battled a knee injury all season) as a USC Trojan, Redd’s college career has been anything but smooth. “It’s been a roller coaster,” Redd said. All of the twists and turns will end Saturday at the Royal Purple Las Vegas Bowl where Redd will be under the leadership of the fifth different head coach of his college career. Although Redd never played a down for current Penn State head coach Bill O’Brien, he did go through spring practice after the former New England Patriots assistant was hired. His departure from State College was unceremonious on one coast while greeted with cheers and jubilation on the other. In Los Angeles, Redd was deemed the missing piece for a team that rid itself of a two-year bowl ban and was destined for a national championship. Meanwhile, Nittany Lion faithful viewed him a traitor not tough enough to stick through a tough situation. As a result of the sanctions handed down on Penn State in light of the Jerry Sandusky scandal, Redd and others had the opportunity to change schools without penalty. Redd decided transferring would be the best decision for him. Overnight, he became public enemy No. 1 in State College. He was called all kinds of names, most of which can’t be reprinted here. The hate was so much that he had to get rid of his Twitter account. While Los Angeles provided a fresh start, fun, sun, and palm trees, his first season in Cardinal and Gold was anything but a sunny day. The 2012 Trojans were, arguably, the biggest disappointment in NCAA football history, starting the season as the preseason No. 1 and finishing 7-6. As fate would have it, Penn State finished 8-4, giving Redd detractors even more ammo. Off the field he dealt with being almost 3,000 miles away from home while his dad battled health issues along with his family and friends having to persevere through Hurricane Sandy. He also dealt with the loss of a friend. Less than two months after Redd came west, his close friend Marcus Dixon was shot and killed. 2013 presented the second head coach firing of his career when Lane Kiffin was relieved of his duties in late September. Frustrating. A nightmare. A roller coaster. Those are all words Redd has used to describe his college career. Still, today, he walks around as a Trojan with no regrets. He doesn’t regret going to Penn State. He doesn’t regret leaving. He doesn’t regret coming to Southern California. Although a goal, he never allowed himself to think national title when he decided to call USC his home in 2012. His biggest frustration, however, has been his injuries. 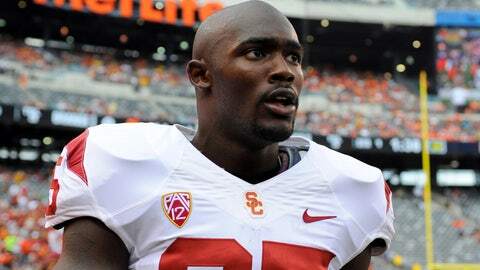 Redd has watched most of the most memorable moments of the 2013 USC season from the sideline. The Trojans upset of then-No. 4 Stanford? Redd was a spectator. When USC hits the field for a chance to win their 10th game of the season? Redd, likely won’t be in uniform. He’s played just six games this season battling a knee injury. “The worst thing you can do for a football player is take away football,” he said. To compound all the things that went wrong in the 2012 season, Redd fumbled the ball five times. The majority of which were due to a shoulder injury. Redd, instead has focused on the positive. If his college experience has taught him anything else, it’s taught him that – to be positive. His level of positivity has come as a surprise to a number of his teammates, who watched him battle a knee injury his entire senior season along with all of the other obstacles he’s overcome since joining USC.